Had she been born into any other family, her life may have been considered a normal one. However, when your father and brothers are world renowned actors, one of whom later assassinates President Abraham Lincoln, it’s impossible to be judged by the standard of “normalcy”. So was the case of Rosalie Ann Booth, the eldest daughter of theatrical genius Junius Brutus Booth and his “wife” Mary Ann Holmes. In literature about the Lincoln assassination or the Booth family, Rosalie is mentioned very little, if at all. In the brief lines where Rosalie is discussed, she is often subjected to unsubstantiated claims of being mentally inept. Author Stanley Kimmel who wrote the book, The Mad Booths of Maryland, seems to be the source of these claims stating that Rosalie, “had little of Junius [Jr.]’s calm common sense, being inclined to a neurotic moodiness that kept her from enjoying the normal social pleasures of a young girl. Apparently she was never able to throw off this morose disposition, even as a grown woman, for we seldom hear of her participating actively in the lives of her brothers and sister…” While Rose (as she was called by her family) was not the outgoing girl that her younger sister Asia was, family letters demonstrate that she not only engaged in social pleasures as a young woman but also took an active interest in her siblings throughout their lives and even beyond. Rosalie Ann Booth was born on July 5, 1823 at the Booth family farm near Bel Air, Maryland. The timing of her birth, during the break between theatrical seasons, allowed her father to be present during her birth. Witnessing the birth of one of his children would later prove to be a rare event for the often absent Junius. When Rose was two years old, her family journeyed back to her parents’ native home of England. Rose, along with four year-old Junius, Jr. and newborn Henry Byron, resided in England for a year while their father attempted to renew his acting career in London. After coming back to the U.S., the family returned to their small cabin in Bel Air. Over the next seven years, the growing Rose witnessed the birth of three more siblings at the farm. Then, as her father was touring in 1833, tragedy struck. In February, the Bel Air farm experienced a cholera epidemic. Nine year old Rose never became ill, herself, however she watched as her three youngest siblings, Mary, Frederick, and Elizabeth, all perished from the water borne infection. In the aftermath of their deaths, Rose’s mother, Mary Ann, was hopelessly grief stricken. Author Nora Titone makes the likely supposition that it was these, “dark weeks of 1833 when cholera killed so many of Mary Ann’s children”, that created a, “close tie” between Rose and Mary Ann. For the remainder of her days, Rose was her mother’s devoted and loyal companion. The Booth family matriarch, Mary Ann Booth. Over the next two years, Mary Ann and Junius had two more children, Edwin and Asia. In the fall of 1836, Junius decided that, after an absence of ten years, he wanted to return to England to act. Rose was 13 years old during this second trip to her parents’ homeland. Sadly, tragedy followed the family across the ocean when Rose’s 11 year-old brother, Henry Byron, caught small pox. He along with Junius, Rose, Edwin, and Asia had all been given the vaccine for the disease before setting out for England, but on Henry the vaccine had no effect. He died in England on December 28, 1836. Again, it is likely that Rose was the chosen one to comfort her grieving mother. While in England, Junius, Sr. wrote to his father back in Maryland stating that, “Rosalie goes to school and is improving very fast”. Far from mentally inept, Rose took to school well and learned to write effectively and eloquently. The Booths returned to their Maryland farm in 1837 and in, May of 1838, a new son was born, John Wilkes. For a time, life on the farm was quiet. Then in 1839, the Booths were besieged by visitors from England. The “guests” were Junius Sr.’s sister, Jane, her husband, James Mitchell, and their litter of eight children. The Mitchells were destitute and had used Junius’ name to gain food and clothing after landing in America in March of the previous year. The reason for their poverty was James Mitchell, a beast of a man who worked little, drank profusely, and physically abused Jane. When the Booths were in England, Junius had given his sister some money so that she might escape her husband and bring the children to America. Junius, along with his father Richard Booth, were furious when they saw that James Mitchell had made the journey with Jane. The farm and cabin became a very crowded place for Rose and her siblings. With such limited space, the outdoors became the children’s area when there was no snow on the ground. What experiences the teenage Rose might have had with her needy cousins are unrecorded, but it is very likely that the cohabitation worked to push Rose even closer to her mother, who was also suffering under their invasion. In February of 1840, the last Booth child, Joseph, was born. 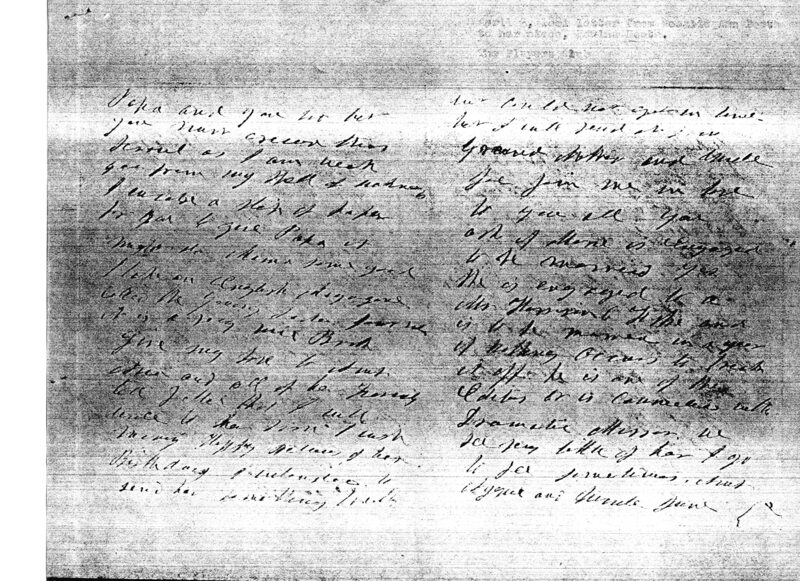 A letter written by Junius to Mary Ann in June of 1840 shows his affection for all of his children, “Kiss them for me, and give my love to each and all from Rosalie down to Joey” (Junius, Jr. was with his father when this letter was written). Despite the added cost of supporting the Mitchell clan, Mary Ann Booth needed a respite from the interlopers. Starting in the fall of 1840, the Booth family began renting a home in Baltimore, spending only the summers on the family farm. In 1846, the Booths purchased their own two story brick house on North Exeter Street. They would remain in Baltimore until the death of Junius Brutus Booth in 1852. When their father died, Edwin Booth was just starting off on his acting career and Junius, Jr. had never gained much success in his theatrical endeavors. Left without a steady means of support, Mary Ann chose to rent out the Baltimore home and move her children back to the farm. Over the preceding years, the Mitchells had been evicted from the premises and Junius Sr. had started construction a dream home for his family. Sadly, Junius did not live to see his home, “Tudor Hall” completed. When Mary Ann moved in following Junius’ death, she was joined by a now almost 30 year-old Rose, who helped her care for 17 year-old Asia, 14 year-old John Wilkes, and 12 year-old Joseph. Tudor Hall, the Booth family home near Bel Air, Maryland. The most complete views of Rose come from the writings of her younger sister, Asia. So little is known about Rose’s childhood and early womanhood due to the lack of family documents during that period of time. When Asia became of age, she filled the role as the Booth family chronicler. As a teenager on the family farm, Asia started a correspondence with a friend named Jean Anderson. This correspondence would last the rest of Asia’s life and the letters she sent to Jean give an honest view of the quite normal life of the Booth family. After the tragedy that engulfed her family, Asia would write four manuscripts about her family. Her 1874 work, an untitled book about her misguided brother, is filled with stories about life on the farm in the 1850’s. In this volume, Asia writes of Rose, “My sister had been from childhood always more or less an invalid.” However, Asia’s own period letters during the time and even the stories that she recounts in her book, do not support this view of Rose. The probable reason for Asia’s inclusion that her sister was, “an invalid” is that when Asia was composing her manuscript around 1874, Rose had become a withdrawn, and possibly infirm, woman. During these years at the farm, however, there was a vibrancy and liveliness to Rose. Through a mixture of Asia’s letter to Jean Anderson and the volume on John Wilkes, the life of Rosalie Booth is suddenly brought out of the shadows and into light. While living at the farm in the 1850’s, Rose would often return, unaccompanied, to Baltimore to visit friends and shop. “While Rose was in town, Mother and I had all the work to do,” Asia partially complained to Jean in October of 1853. At times these trips to Baltimore resulted in gifts for her siblings. “Rose brought [John Wilkes] home a new saddle” in December of 1853. Rose was well loved by her siblings. In January of 1854, Junius Jr. was visiting from California with his wife and new baby, Marion. Junius gave Marion the middle name of Rosalie, in honor of the sister he was closest in age to. Contrary to Stanley Kimmel’s assertion that Rose never enjoyed the, “social pleasures” of a young girl, there is some evidence that she may have been courted a bit while on the farm. On April 30th, 1854, Asia wrote to Jean, “I am sitting on the porch this afternoon. Dan Scott is walking with Rose over the fields to gather wild flowers,” and later in the letter, “I see Rose coming now with her hands full and Jack Wharton’s tongue outruns Nannie’s.” Rose probably had a desire to get married and Asia wrote of a mysterious rite that it is likely Rose participated in one Halloween. “The female portion of the family, resorted to the woods in perfect silence, found a hollow stump of a tree that contained the mystic dew with which we bathed our foreheads, and standing apart and silent, waited to greet the expected bridegroom. Those who were fated for a married existence either saw or pretended that they there and then beheld him.” It is unlikely that Rose beheld any spiritual bridegrooms that night, as she would remain unmarried for the rest of her life. Rose’s younger sister and Booth family chronicler, Asia. John Wilkes, meanwhile, had escaped the stables unseen and had sneaked into the kitchen as well. He was cooking pancakes like a real cook. After placing them in a covered dish on the dining-room table, he went back into hiding in the kitchen. Rose and Asia seated the ladies in the dining room and proceeded to serve the meal. Rose poured the ladies some coffee. The meal was going well when on the guests remarked that John Wilkes must be working very hard on the farm since they had not yet seen him. Rose replied, “He’ll be in soon, I think.” When the pancakes ran out, Asia had to make a muttering comment about the worthlessness of their servants in order to explain why she had to go back into the kitchen to get a fresh set of pancakes. At once two of the ladies offered to help her get the servants. Asia, panicked that they would follow her and find that there were no servants in the kitchen and just John Wilkes, the impromptu cook, came up with the lie, “We’ve got such a fierce dog in the kitchen.” John gave Asia a new set of pancakes while she informed him that Rose had carelessly called for his appearance. John cleaned himself up and appeared in the dining room about fifteen minutes later. He saluted the ladies and, “dropped a kiss on [Rose’s] fore[head] as if he had been absent from home all day and was not in the least hungry. John, though starving from his hard work at subterfuge, ate very little, knowing that there was nothing left when these meager supplies ran out. He talked of flowers with the ladies and managed to sneak away right before the end of the ladies visit which had lasted the afternoon and most of the evening. Unseen he brought their horses, along with his own, to the mounting blocks. “When the moon had well risen, amid many gay farewells, the horses bore away our visitors and our hungry brother,” who escorted the ladies home. Rose’s actor brothers, John Wilkes, Edwin, and Junius. Edwin Booth made his return to the Booth family farm in 1856 after an absence of four years. During this time he had made a name and, more importantly, a fortune for himself by acting in California. He had also toured Australia and played before King Kamehameha IV in Hawaii. When Edwin witnessed the poverty that his family was living in on the farm, he whisked them away and put them up in a home in Baltimore. The family would never live at Tudor Hall again. I received yours from Nashville dated the 7 inst. Asia has got a fine little girl and is doing pretty well so far. So you see you have won the bet. Clarke telegraphed you on Saturday. Asia wrote one day last week we both got our boxes and are very much pleased with them and I thank you a thousand times. Mother got a letter from June written on the 6th of Feb’y he got the check that she sent and was going to write to you at the same time. He was in good health but little Mary had a very bad cold. He sends his love to you and Joe. In regards to living in New York or Boston it does not make the slightest difference to me as all places are alike as I will have [to] live where Mother does (unless I get married, and have a house of my own but I don’t think that there is any danger of that yet awhile) Mother thinks that she ought to be where Joe is as he is the one that wants some one to take care of him. She [said] that John has been away from home so long that he can get along very well by himself. Love to Joe and tell him to find time to answer my letters. Sleeper says that he got something for Joe to do at the Arch if he has made up his mind to follow the stage. In regard to Wilkes’ fight at Richmond it was with a man named Pat Redford or Bedman in the box office who had insulted him several times before but he did not say what the insult was. He played Ludovico the other night for Julia Dean Hayne’s benefit and was the only one called before the curtain and had a 6 minute call. He seems very much pleased at it. He has got your letter was to answer it. Mother has just written to you and says she will tell you all about how she wants to live as for me all places are alike. Asia sends her love to you and Joe. I am glad that Joe succeeded so well in Biondello. Rose, hardly seems to be a victim of a, “morose disposition,” that prevented her from, “participating actively in the lives of her brothers and sister” after reading this letter. Rather, she writes clearly and fondly of all of her siblings. She notes John Wilkes’ long curtain call while performing in the play Evadne in Richmond, and sends her congratulations to her youngest brother’s attempt at acting alongside Edwin in the play The Taming of the Shrew. Both events, as a matter of fact, occurred on the same day, March 2nd, 1860. Rose mentions John Wilkes’ long curtain call for his performance as Ludovico in Evadne (top) and Joe’s appearance alongside Edwin as Biondello in The Taming of the Shrew (bottom). “Mother & Rose are boarding in Marshall Street at a private house,” Asia wrote in December of 1860. “Rose and Mother are very well,” she wrote in November of 1861. On January 15th of 1863, Mary Ann wrote to Edwin noting that, “Rosalie went yesterday to Blockley post office – but no letters…” The pair was hoping for word from Joe, who had run off to England and then Australia with hardly a note to keep them apprised of his whereabouts. Further demonstrating Rose’s involvement in the lives of her siblings, she and Asia went to see John Wilkes perform while he was in Philadelphia. Together, they saw him in The Marble Heart at the Arch Street Theatre on March 3rd, 1863. Rose and Asia saw this performance of their brother, John Wilkes. Along with supporting John Wilkes’ theatrical career, Rose also at one time supported her brother financially. In April of 1863, John Wilkes bid on land in Boston’s Back Bay. He successfully purchased the lot at 115 Commonwealth Avenue for $8,192.10. John Wilkes had to pay a quarter of the sale in cash within fourteen days of the sale. On April 19, 1863, John Wilkes wrote to his representative Joe Simonds in regards to the matter: “Rose sent Orlando a draft from Phila. and I sent one from here. Has he enough?” Where Rose got the money to assist John Wilkes is unknown. Perhaps it was her savings from the living allowance Edwin provided for her. Regardless it is interesting that John picked Rose to help him with his down payment and demonstrates a connection between the two siblings. After three semiannual installments, Wilkes succeeded in acquiring the land on October 17th, 1864. However, when the deed was finally delivered, he had it made out to Mary Ann instead of himself. This was about the time that John’s thoughts were of “patriotic” duties and perhaps he had the land deeded to Mary Ann to ensure it would not be confiscated by the government after his actions. In the same vein, John started to close his other investments, namely his failed oil ventures. His well in Venango County, PA had produced nothing. He transferred his essentially worthless share of the ”Dramatic Oil Company’s” land to his brother, Junius, and his business agent, Joe Simonds. Outside of his Dramatic Oil Company land, John had also invested $1,000 in a share of some property along Pithole Creek. The land had not been drilled when John decided to transfer that interest away as well. The recipient of this share was his sister Rose. Perhaps this was John’s way of repaying her for her funds when he was purchasing the Boston land. When the land was finally tested in early 1865, Joe Simonds wrote to Booth that, “Pithole promises fair to be a good thing and a fine arrangement for Rosa. You might not to have given her more than half of that share, John, for it now looks as though it would prove a fine income.” In the end, the Pithole property proved to be a very lucrative one and caused the small area to become a boom town in 1865 with a fascinating, albeit short lived, history. A letter from a former Booth neighbor written in 1886 states that Rose acquired a deal of money from her brother’s investment, but, thus far, no concrete evidence has been found to support this claim. Rose’s stock in the area was never sold or transferred, however, when the town went bust about two years later there would have been no need for Rose to officially sell her share in the now worthless land. It is also a possibility that Rose received no money from this venture and, due to the events of April 14th, 1865, washed her hands of yet another thing associated with John Wilkes. In John Wilkes’ last letter to his mother, written the day of the assassination, he writes, “everything is dull” and that he has received a letter, “from Rose”. In a few short hours, John changed the history of the Booth family and America forever. Rose’s younger brother, John Wilkes. Mary Ann and Rose were living in Edwin’s home in New York in 1865. While Edwin was on tour, doting grandmother and aunt cared for Edwin’s daughter Edwina, since her mother had died in 1863. The news of Lincoln’s assassination by the hand of her brother hit Rose like a ton of bricks. One family friend later recalled arriving at the Booth household, on the morning of the 15th, “We came to the somber household within whose walls a mother and sister sat grief stricken and stunned with grief, like Rachel of old refusing to be comforted.” Quickly that same day, Mary Ann departed for Philadelphia. Asia had been suffering an already difficult pregnancy and Mary Ann worried how the dreadful news would affect the daughter who loved John so much. Rosalie stayed at Edwin’s home in New York to care for Edwina. Another friend of Edwin’s, Launt Thompson, stopped by the Booth home after Mary Ann had left. He found Rose, “all alone – waiting for some definite information.” What thoughts swirled in Rose’s mourning mind can only be guessed. When it was rumored that John Wilkes Booth had been captured, one later account states that Mary Ann cried out, “O God, if this be true, let him shoot himself, let him not live to be hung! Spare him, spare us, spare the name that dreadful disgrace!” John’s death at the Garrett farm on April 26th, ended the family’s ongoing torment, but they would never truly awaken from the nightmare of his legacy. There is a marked silence of all the Booths in the years following John’s crime. Asia, in her grief and busy motherhood, wrote less often to Jean. She buried herself in work, writing a biography of her father in an attempt to reclaim the honor of her family name. Edwin retired briefly from the stage but returned with America’s unanimous support. He would never again act in Washington, D.C., however. During this period Mary Ann needed Rose more than ever. The mournful hours the two spent together are immeasurable. From 1865 onward, the references to Rose in family letters slowly change from the vibrant, young woman at the family farm to an increasingly isolated and sad individual. Rose’s brother Edwin and niece, Edwina. On March 18th, 1868, Asia moved to England with her husband, John Sleeper Clarke, and her children. Though she wrote of her hope to return to America in a few years or so, only her corpse made the return trip to be buried in the family lot at Green Mount Cemetery in Baltimore. With the main chronicler of the Booths across the ocean, the records dissipate considerably. In the aftermath of the attempt on his life, Edwin felt that an acting tour of England would benefit him. Asia, having been isolated in England for the last ten years, greatly supported a visit by her brother: “Sometimes I think it is sad for all to wish to leave America as poor Mother would be left completely alone, but she really cares more for Rose and Joe than for any others, and they seem to have sunk into a groove – that no one can lift them out of…”Edwin acted in London during the 1880/1881 season, returned home, and then completed an acting tour of the European continent for the 1882/1883 season. Mary Ann and Rose lived in New York during this time, summering with Joe at his home in Long Branch, New Jersey. In September of 1883, the eldest Booth sibling, Junius Brutus Booth, Jr., became fatally ill with bladder and heart problems. Edwin and Joe rushed to his home in Boston. He died on September 16th at the age of 61. Rose did not attend her older brother’s funeral as she stayed home to care for 81 year old Mary Ann. In January of 1884, Mary Ann Booth fell at her and Rose’s shared home in New York. The accident resulted in a broken hip, the effects of which she would never recover. Rose went to live with her brother Joe who spent his time between Long Branch, New Jersey and his doctor’s office in New York. In 1886, Edwin visited his brother and sister in Long Branch and the trio conversed about the family’s life back on the Bel Air farm. Rose, helped fill in her younger brothers’ memories as to the early goings on at the farm. When Joe and Rose were back in New York in January of 1888, Edwin visited the two. He wrote to Edwina, who was by now married with two children of her own, “I’ve seen Rose several times, and shall say good-bye to-morrow. I do all I can for her, but nothing on earth can render her lonely life less weary, poor soul!” It appears that Rose never got over the loss of her mother and continued to mourn her passing. Asia Booth Clarke died in England on May 16, 1888. Her body was shipped back to America by her husband, John Sleeper Clarke. On June 1st, the funeral for Asia was held at Green Mount Cemetery. 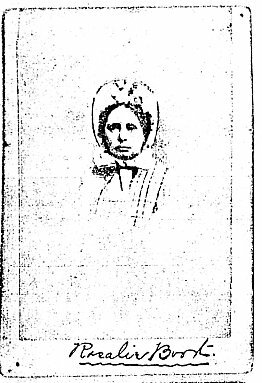 From newspapers, it is difficult to determine if Rose attended her sister’s funeral. The only names noted in the press were that of Asia’s husband, John, and their famous brother, Edwin. It seems likely, however, that Rose and Joe would have been there to help lay their sister to rest. Rose was living with Joe at Long Branch in December of 1888, when an apparent attempt on the life of Joe almost ended her own. One night, a knock was heard on the Booth home in Long Branch. Joe had not yet returned from work, and so Rose answered the door. As she opened the door an unknown assailant threw a brick at her head. The brick hit the door a few inches from Rose’s head. At the same time a number of stones and gravel were thrown at the door and windows of the home. Rose quickly shut the door and called to the servants to lock the house down. When Joe arrived home, he found the household very much alarmed and a two pound brick on the porch. As stated in the papers, “where it struck the door casing was a deep dent, showing that if the aim of the wretch who threw it had been true the blow would probably have killed Miss Booth.” Dr. Joe Booth had been involved in a lengthy legal dispute with his neighbors over a tall fence he had put on his property and believed it was one in that “incensed” party that had desired to harm him. The remains of Miss Rosalie Ann Booth, daughter of Junius Brutus Booth, and a sister of Edwin Booth, who died in New York on last Tuesday, were quietly interred at noon yesterday in the family lot at Greenmount Cemetery. Only the immediate friends of the family, a few personal friends, and about forty outsiders witnessed the interment. Mr. Edwin Booth had made a special request that the funeral should be as quiet as possible. The remains, which arrived from New York on Thursday, were removed from the undertaking establishment of Henry W. Mears at 11:00 o’clock. At the same hour Messrs. Edwin Booth, Dr. Joseph A. Booth of New York, Lawrence Barrett, John W. Albaugh, of the Holliday Street Theater, Arthur B. Chase, agent of the Booth-Barrett Company, George Graham and wife, Mrs. D. A. Anderson, Miss Marion Booth, a niece of Miss Booth, all of New York, and a colored nurse, left the Mt. Vernon Hotel in several carriages for the cemetery. The remains arrived a little before twelve o’clock, and were followed by Rev. Peregrine Wroth, of the Protestant Episcopal Church of the Messiah. The Booth party arrived a few minutes later. The burial lot is in the southern end of the cemetery, to the right of the main entrance. Mr. Edwin Booth, upon whose left arm leaned Mrs. [Marie] Anderson, a bosom friend of his sister, and at whose house she died, took a position on the north side of the grave. Miss Marion Booth stood next. The other members of the party gathered near. Rev. Wroth recited the impressive funeral service of the Episcopal Church. Mr. Booth seemed much depressed. After the services Miss Marion Booth strewed the casket with white Marechal Niel roses. The remains were cemented in the brick-lined grave. Mr. Booth, accompanied by Mrs. Anderson, visited the grave of Mrs. Asia Booth-Clarke and also that of Mrs. Susan Hyde, an old friend of the family. The party then left the cemetery. In the meantime, the grave was strewn with flowers. It was completed covered with evergreen and smilax, pinned down with wire. At the head rested a beautiful large bud of yellow roses and smilax, which were brought out by Mr. Booth. In the center was a magnificent floral piece, the token of Mr. Lawrence Barrett. It was made of about fifteen white lilies backed up by La France roses and smilax and tied with white ribbon. – Baltimore American & Commercial Advertiser – January 19th, 1889. A white Marechal Niel rose. Marion Rosalie Booth laid the same type of rose onto her aunt’s grave. Junius and Edwin knew their younger brother was popular with the ladies. As he toured around from city to city, he invariably left behind smitten and heartbroken girls. He was called the “handsomest man in America” by some and woman swooned over him. A letter to John from a female admirer found in his trunk at the National Hotel started with the words, “I am about your own age, possibly a few months younger, and you will probably wonder what a woman” before being conveniently torn off. Appropriately then, Junius and Edwin worried that some of John’s former admirers might attempt to take advantage of Mary Ann in her grief by claiming to be John’s fiancée or, worse yet, the mother of his children. Sure enough, widows of all shapes and sizes came out of the woodwork. Edwin would later write that he was besieged by about “twenty [widows] that wrote to me just after John’s death.” While Edwin ignored and denied them all, at least one crafty “widow” discovered and successfully preyed upon Rose. The alleged widow was named Izola Martha Mills, though her name went through many variations over the years. She claimed that John Wilkes Booth had fathered her daughter, Ogarita, and son, Alonzo. In 1937, Ogarita’s daughter, Izola Forrester, wrote a book entitled, This One Mad Act, in which she claimed John Wilkes as her grandfather. The book is poorly written, the evidence is flawed, and though there are claims of family letters and documents that “prove” various points, they are not provided in any form. In 1991, two Burrillville, Rhode Island historians wrote a book entitled, The Elusive Booths of Burrillville, in which they investigated many of the claims in Forrester book trying to prove, one way or another, the legitimacy of the “Booths” who later resided in their hometown. Their overall thesis was inconclusive, but they were successful in disproving several of Forrester’s grandiose claims such as the notion that John Wilkes Booth did not die at Garrett’s farm and, instead, later met up with Izola Mills in California and had another child with her in 1870/71. The issue that kept the Burrillville authors from dismissing Forrester’s book entirely was the fact that poor Rosalie Booth had fallen for Izola Mills’ claim to be the mother of her brother’s children. Rose’s imposter niece and nephew, Ogarita and Alonzo. It is interesting that Mrs. Rogers supports the notion that Izola’s children are John Wilkes’ in this letter. In Ella Mahoney’s 1925 book, Sketches of Tudor Hall and the Booth family, she recounts that, “Mrs. Rogers did not believe her [Izola’s] story, and of course advised her against trying to get the girl’s interests advanced in that capacity, as the daughter of Booth.” Beyond the recollections of Mrs. Rogers, however, there are other, more personal, pieces of evidence that prove that Rose took an interest in Izola’s children and provided for them financially. How do we know that it was Izola, and not another of the many “sharpers” Junius, Jr. was worried about, that tricked Rose out of her money? The evidence for that comes from two sources. First, in the family papers for Izola Forrester, the woman who claimed John Wilkes as her grandfather, there is a letter written in 1888 from her mother Ogarita to her brother Harry. In it she states, “I received a beautiful letter from Miss Rogers in Baltimore. You remember us speaking of her. She sent her love to you, calling you my little brother, she is going to find out Aunt Rosalies address for me. She is living somewhere in New York with Uncle Joseph.” It should be mentioned here that Ogarita was an actress and used her alleged paternity to increase her fame and appeal. From this letter it appears that Ogarita either truly believed she was John Wilkes’ daughter, or continued the subterfuge for financial and professional reasons even after her mother’s death. If Rose upheld her promise to Edwin, it is unlikely that she held any additional correspondence with Izola Mills or Ogarita after 1885, explaining Ogarita’s ignorance of “Aunt Rosalie’s” current address in 1888. The handwriting of the inscription was looked at by a handwriting expert in 1988. 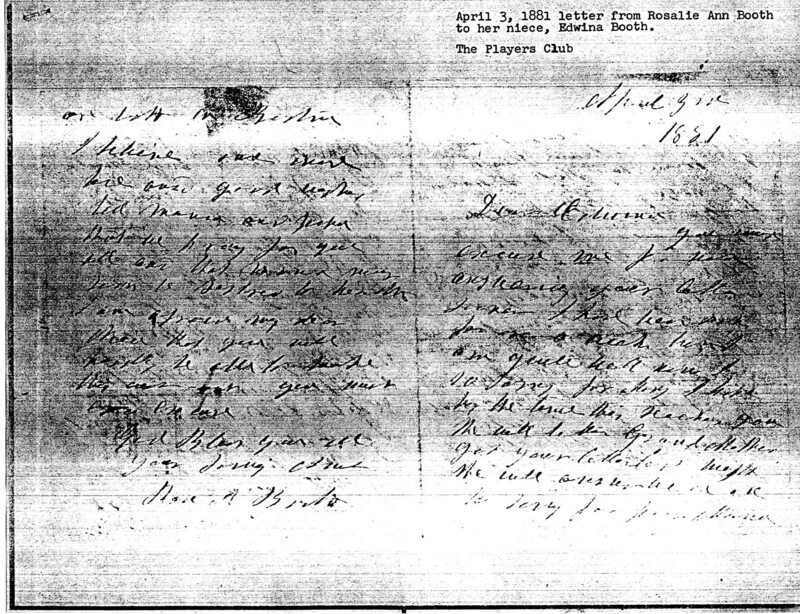 Using a letter written by Rose housed in Edwin’s club, The Players, a comparison was made. The inscription in the book was authenticated to be from Rose. The length of time that Izola Mills successfully swindled money from Rose is uncertain. What’s even more uncertain is what led Rose to be convinced by this imposter. Perhaps it is like what Mrs. Rogers implied. As the recipient of John Wilkes’ oil profits, Rose was torn about what to do with the money from his brother turned murderer. When approached by Izola, playing the part of a grief stricken widow with “Booth” children to feed, Rose discovered the only ethical use for her brother’s blood money. Or perhaps Rose chose to believe Izola because, in her own way, she truly missed her brother, regardless of his crime. Though it was a lie, giving money to Izola was her way of preserving the decent part of her brother’s memory. Regardless of her motivation, Edwin’s letter seems to prove that Rose eventually saw Izola for the thief and liar that she was. However, due to Rose’s temporary willingness to believe that her brother had left innocent children behind, the lies spread by Izola have tricked many historians, including author Stanley Kimmel who included Izola and Ogarita in his 1969 reprint of his book, The Mad Booths of Maryland. As was discussed at the beginning of this biographical sketch, had Rosalie Ann Booth been born into a family other than the Booths, her life would have been considered a normal one for the time period. Though she did not marry and certainly had a prolonged period of loneliness after the death of her mother, descriptions of her as having perpetual “neurotic moodiness” or of being mentally inept, do not appear to be justified. In the light of family letters and memoirs, Rosalie is shown to be a devoted and caring soul. While she never achieved the fame (or infamy) of her parents and siblings, she clearly supported and loved them dearly. She was a witness to the darkest times in the Booth family, of which they had more than their fair share, but she was also a participant in some of the happiest moments in their lives. Though often forgotten or ignored today, Rosalie was a Booth and, therefore, an influential figure in American history. There is at least one more letter written by Rosalie Ann Booth. It is housed in the Hampton-Booth Library in The Players. The library’s current policy prohibits the copying of materials and a so a transcription is only able to be made in person. The author discovered a poorly photocopied version of the letter in the Izola Forrester family papers, as it was this letter that was used to authenticate Rosalie’s signature on Izola Mills’ book of poetry. A workable transcription has not yet been produced due to the low quality of the source image and difficulty in reading Rose’s handwriting. Work will continue on a transcription and, when completed, a follow up post will relate its contents. In the meantime, the photocopy of the letter can be seen by clicking HERE and HERE. The only known image of Rosalie Ann Booth is the engraving included above. The engraving is based on a true picture, hopefully housed at The Players. A poor photocopy of the original image, and basis of this engraving, was provided to the author by Art Loux. That image can be viewed by clicking HERE. The writing of this biography utilized many, many resources. A list of those resources follows below. Though each fact and quote above has not been specifically footnoted, all are based on a consulted reference. Transcriptions of Asia Booth Clarke’s letters to Jean Anderson Sherwood, currently housed at the Maryland Historical Society, were provided courtesy of Art Loux and Ford’s Theatre NPS. The transcription of Rosalie Ann Booth’s 1860 letter was first published in the June 1979 edition of Richard Sloan’s Lincoln Log. A copy of the original document, housed at the New York Public Library, was provided courtesy of Richard Sloan. Draft copy of “John Wilkes Booth’s Enigmatic Brother Joseph” by John C. Brennan provided by Art Loux. “Boston: A Home for John Wilkes Booth?” By Richard and Kellie Gutman in the Surratt Courier, September, 1985. Congratulations Dave, you have brought Rosalie to life! The dissagreement between Joseph and the citizens of Long Branch was over him erecting a tall fence to shield him from the ice cream parlour that was being opened next door. It seems the citizens cared more for ice cream than the privacy of another seasonal, wealthy resident along Ocean Ave. Thanks for the support, Rich. This post was a lot of work, but I’m proud of it. With regards to Dr. Joe and his fence, it appears that his neighbors may have had cause to be against it as much as they did. From what I’ve read, the first fence he put up between the ice cream parlor and his house was of flimsy material and the owner of the ice cream parlor, a man named Kurrus or something like that, was worried that it would topple over onto his establishment and therefore sued Joe to take it down. The ensuing legal battle lasted years. At one point the fence did fall down, damaging the ice cream parlor and I believe Joe kept it down for awhile after this. He reignited the feud a year or two later by putting up a 20 ft fence. His neighbors were worried about property values and the like as his enormous fence now blocked the view of the ocean and was an eye sore. The brick incident occurred after Joe had put up this 20 ft. fence. Thank you so much for this article. So little is written about Rosalie and you did great job bringing her to life. Too bad we don’t have any insight on how she really felt i.e. whether she regretted not finding someone to marry, having children etc. The first time I read this I cried for her. Thanks again for this article. Thank you, Carolyn, for motivating me to write this. When you asked to see Rosalie’s letter, I wanted to see if I could give you a little bit more in her. It’s the biggest compliment one can get to be told you moved someone with your writing. Thank you. Another great piece of research, Dave. Over the years, I have heard so many theories as to what “ailed” Rosalie – from mental retardation to even alcoholism. I have always suspected that it was something as simple as being an introvert by nature in a family of extroverts. I have also wondered if the torture that the family took at the hands of Booth Wife #1 when she arrived in Baltimore took a toll on Rosalie, who was certainly mature enough at that point to fully understand the stigma attached. And, finally, in the family values system of the early ages, it was often the oldest daughter who became the second-in-command of the family in order to assist the mother — especially in a large family and as the mother advanced in years. Perhaps Rosalie just became resigned to that fate. Wonderful insights, Laurie. Thank you for sharing them. Wonderful research, Dave. You have handled a part of the Booth story which has been rarely touched with understanding and expertise – thanks for bringing a clearer understanding of a “forgotten” Booth – Rosalie…. This is extremely late, but thank you so much for your research on Rosalie, Dave! This is absolutely fascinating and probably the best article on this mysterious lady that I’ve read. There are times I wonder if she might have suffered from Asperger’s Syndrome… but as Laurie said, she simply might have been the introvert in a family of extroverts! I, too, think that Rosalie was merely a normal individual in a home filled with larger than life personalities. Her mother fit this mold as well, and this is probably why they shared such a deep connection. Hi Dave , I want to thank you for all the hard work you’ve done on getting such great and helpful info compiled and put forth for the better understanding of this most fascinating family and the events that shaped our nation. I do have an increasing interest in two members of the Booth family that are very often left out of discussions regarding the family; Blanche De Bar Booth, and Marion Booth. As you know, both are daughters of Junius Brutus Booth Jr. I only know a few facts about Blanche such as her date of birth & death, and according to what I read she was J. Wilkes Booth’s favorite niece as she was considered to be rather a rebel sharing some if the same views as her uncle John. I read that Blanche was an actress and that she was considered to be one of the most beautiful actress at one point. I know nothing more about Marion Booth other than her date of birth & death. It seems as though Marion Booth is mentioned even less than Blanche(,in general.) I did notice that Miss Marion Booth was mentioned to be in attendance at Rosalie Ann Booth’s funeral. What is so frustrating to me is that (, just like Rosalie,) only ONE image of Blanche De Bar Booth is available, at least to my knowledge, and I have NEVER been able to locate an image of Marion Booth at all. One would think that of all the different museums involving the Booth family that at least a few photos of these rather obscure women in the family should be some where and made available. Any leads or info that you might have on this would be greatly appreciated. Off the top of my head, I don’t know much about Junius’ daughters. The best sources I can think of now would obviously be The Players club, since they might have correspondences between the girls and their uncle Edwin. I also recall Asia mentioning caring for Marion for a time while the girl was in Philadelphia. She mentioned Marion converting to Catholicism like her own children, I believe. There may also be some small remarks about the girls in Arthur Bloom’s new biography about Edwin. Since Blanche was an actress, I would also look at newspaper records searching for engravings of her. As for other pictures and further information, I’ll have to look into them at a later date. I loved reading your post. I learned a lot more about Rosalie Booth than I had before reading your post. I found your article because I’ve been doing some research into Lizola Mills the mother of John Wilkes Booth’s supposed children and her scamming of the Booth family. I have a little more information that can fill in the background of her interaction with the Booth family. I should point out that the man in the picture to the right of Ogarita is not Alonzo but a younger half-brother of Ogarita named Harry who was the son of Lizola Mills’ 2nd husband, John Stevenson. Also the letter to the newspaper that Edwin Booth was referring to was actually on page 4 of the 05 Dec. 1885 edition of the New York Sun. Edwin got the newspaper wrong in the letter. If anyone is interested in seeing it for themselves they can go to the National Archives’ Chronicling America website that has images of old newspapers for free. 1. Her 3rd child, Ogarita Elizabeth Bellows b. 23 Oct. 1859 in Providence R.I.
2. Her 4th child, Charles Alonzo Bellows b. 16 May 1861 in Cambridge Mass. I should also mention that in addition to collecting money from Rosalie, Lizola was also collecting a Minors’ survivor pension from the Federal Government until 1877, claiming that Ogarita and Alonzo were the children of her deceased first husband Charles Still Bellows who had been a sailor in the U.S. Navy. However, Charles had been on a Naval tour from about Jan. 1858 to Sept. 1860 which would make it impossible for him to be the biological father of Ogarita and extremely unlikely to be the biological father of Alonzo. Lizola seems to have stayed in New England during 1859 which would also make it impossible for John Wilkes Booth to be father of Ogarita as well, since he was performing at the Richmond Theater during the time frame of her conception. I don’t know enough of the Booth timeline to know if he was in Boston at the right time for Alonzo but since Lizola was lying about Ogarita, I think it’s pretty safe to say that Alonzo wasn’t Booth’s child either. It is always amazing the concepts that seem so bizarre to me , when these posts are written.As a Booth cousin by blood and,marriage, I can not understand when strangers try to figure out the life of Rosalie. In my generation, I had a cousin who was also devoted to her mother and they lived together their whole lives. My cousin was attractive and social,had a great job, spent time traveling to Greece with my sister, had many friends but in the end, her devotion was to her beloved Mother, until they both passed away. Rosalie was a quiet type of personality like her youngest brother, Joseph Adrian. After 150 years, I wish a few members of my family could have some peace! Joanne Hulme- related by blood and Marriage through grandmother , Jane Booth and, Great Aunt, Cora Mitchell Booth, wife and cousin of Joseph Booth. I’m more than a bit perplexed by your reaction to my post about Rosalie Booth. The purpose of this research is to give Rose the acknowledgement she deserves as a valuable member of the Booth family. Nothing I have written can be viewed as an attack on her character. Rather, I think I’ve made a pretty convincing argument that Rose was far more intelligent and vibrant than most historians have given her credit for. However, I am very pleased to read your last sentence regarding your hope that the members of your family could have some peace. If the misguided escape theorists ever attempt to disinter Edwin Booth, it’s good to know that you will be on the front lines fighting to prevent it. In that way Edwin will continue to rest in peace, just like his brother John Wilkes does in Green Mount Cemetery.